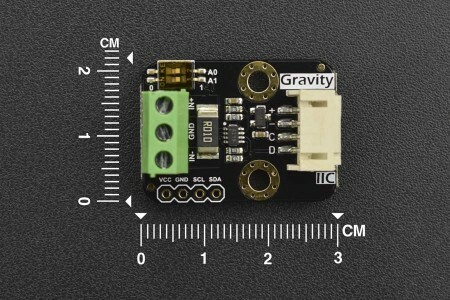 Gravity: I2C Digital Wattmeter is a high-resolution, high-precision, large-scale measurement module that can measure the voltage, current and power of various electronic modules and electrical equipment within 26V 8A, and the maximum relative error is no more than ±0.2% (A simple manual calibration is required before usage). It can be used for power consumption or battery life evaluation of solar energy systems, battery, motors, controller or electronic modules. 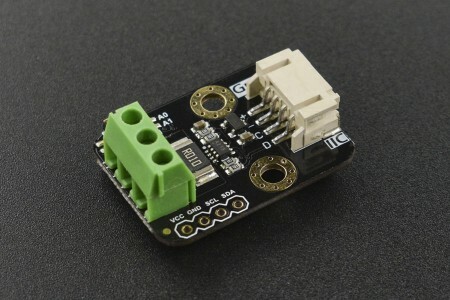 The module adopts TI INA219 zero temperature drift current/power monitoring chip and 2W high power low temperature drift 10mΩ alloy sampling resistor. The voltage and current resolution can reach 4mV and 1mA respectively. Under the full scale measurement condition, the maximum relative error of voltage and current measurement can be superior to ±0.2%. It also provides four I2C addresses that can be configured via the 2P DIP switch. The module accurately measures bi-directional high-side currents (current flowing through the power supply or battery positive), which is especially useful in solar or battery fuel gauge applications where the battery needs to be charged and discharged. This status can be simply determined by positive or negative current readings. In the motor applications, the current can be monitored in real time by monitoring whether the motor current is too large due to overload. In addition, you can use this module to measure the power consumption of various electronic modules or the entire project to evaluate battery life.